Ginger (Zingiber officinale) Vitality™ essential oil is distilled from the root of the ginger plant and lends itself to a wide variety of applications. Used as both a flavoring in the kitchen and as a dietary supplement, Ginger Vitality oil is a distinct and versatile oil that’s great to keep on hand. Ginger Vitality essential oil benefits are derived from its naturally occurring constituents zingiberene and beta-phellandrene, making it a key ingredient in DiGize™, Digest & Cleanse™, EndoGize™, ICP™, and Essentialzymes-4™. No matter if it’s included in a sweet or savory dish, Ginger Vitality essential oil stands out from the crowd. 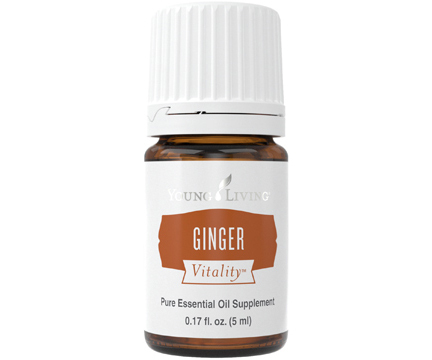 Ginger Vitality Essential Oils Uses: Add a drop to your tea for a nice, soothing hot drink. Dip a toothpick in Ginger Vitality and add it to your stir-fry for a zing of exotic flavor. Ginger Vitality makes a great dietary supplement! Add a drop to a vegetarian gel capsule to support normal digestion*. Add a spicy twist to a refreshing classic! Try adding a few drops of Ginger Vitality to a pitcher of fresh-squeezed lemonade. Mix a few drops of Ginger Vitality with your marinades and salad dressings to add a warm, spicy note. *These statements have not been evaluated by the Food and Drug Administration. This product is not intended to diagnose, treat, cure or prevent any disease.